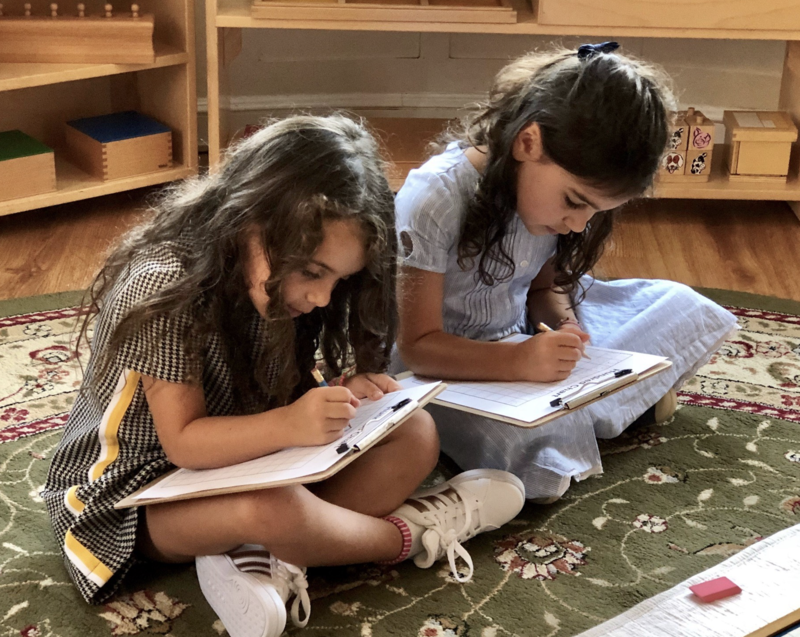 Formative observation by teachers occurs in-the-moment and offers vital information to assess where a child is developmentally, and what skills they have or have not yet mastered. This can occur both while a teacher is giving a lesson and when taking the time to step back and observe. During these moments, teachers can determine what motivates a child in the classroom, whether that child is choosing challenging work, what area of the classroom a child is particularly drawn to, or if a child is ready for a new lesson after mastering a specific work. 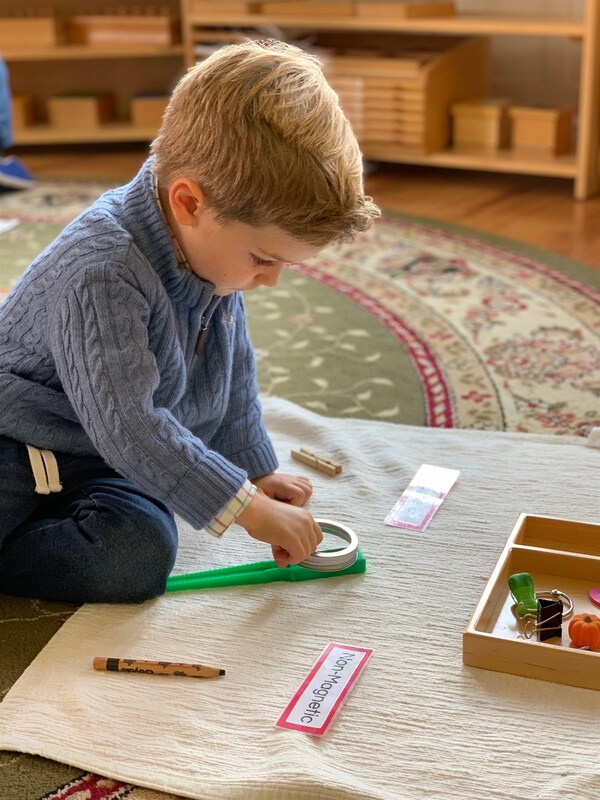 It is important to also remember that while there is a scope and sequence to the Montessori materials in your child’s classroom, we know that children will work at their own pace with support from teachers and peers to help motivate and guide them along the way. This is the first introduction to a new material. Teachers take time to slowly label the item. During this period, it is important to always isolate the desired material and to repeat the words several times while pointing to the appropriate item or card. This period is often a separate lesson, done after the first-period lesson. Its purpose is to extend the handling and action presented in the first lesson. This is the most critical period and should last the longest. During the second period the teacher has the opportunity to review and reinforce vocabulary as well as see what connections the child has made. This is the first time the teacher will ask the child to name the object or idea. This period happens when the teacher is sure that the child will succeed at recalling their vocabulary. The recall period determines the child’s understanding and what information has been absorbed. This may come some time after the second period lesson, as mastery often takes time. The second period can always be revisited if more time is needed to be successful. Once teachers obtain this valuable information through formative observation, it is then recorded and documented for assessment purposes. The type of record keeping used by Kingsley teachers is individualized to each teacher, and used to inform what materials are thoughtfully added or removed from the prepared environment. This lets teachers know what lessons a child may be ready for next, and what skills and concepts have been mastered. This is also the information used to create goals with the students in the Fall, and how teachers are able to track progress of those goals to share with parents at parent-teacher conferences. When determining the skill level in a particular area of development, teachers will always consider the individual child first, taking into account that every child learns at a unique pace, when measured alongside our Early Childhood Benchmarks. 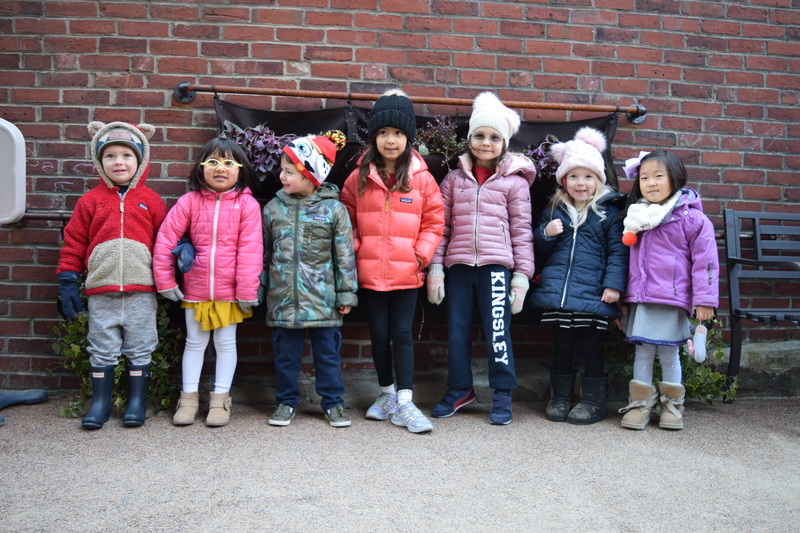 Through intentional and individualized assessment, every child leaves the Early Childhood Division with foundational skills that have been fostered, documented, and communicated clearly so that parents, teachers, and most importantly the students, will continue to build upon that success during their time at Kingsley.